Hiring our professionals for the deep cleaning of your carpets is the best thing you can do. We understand very well how tedious and tiring a task like, especially when you don’t have the right equipment. We, on the other hand, have the best professional equipment. It consists only of special chemical-free cleaning products and powerful machines which are capable of extracting even the most stubborn grime from the fabric of your upholstery possessions. Our professional agency performs carpet cleaning and other services in London and most of the other districts of the city of London. If you want to make your old carpets perfectly clean again, all you have to do is contact us. We use the best cleaning methods for the effective disinfection of the upholstery possessions of our clients. We know that the stubborn stains and the wearing out of the fabric are two of the biggest concerns of our customers when it comes to their favourite carpets. By booking one of our extremely effective cleaning procedures, you can be sure that you will never have to worry about those things again. You can take advantage of our low-cost services from time to time, which will guarantee the prolonging of the life of your upholstery possessions. Leave the hard carpet cleaning to the professionals from our agency. We will provide your upholstery possessions with the cares they need to look best. Even when you vacuum your carpets regularly and disinfect them with various products, it is possible to notice that some stains and marks are still there. other pollution from the fabric of your possessions. We offer a variety of carpet cleaning procedures including steam cleaning, hot water extraction cleaning, dry cleaning, shampooing and many more. You can learn more about all procedures we offer by coming to London. Our staff will welcome you in our office and will explain everything. You will find our prices very affordable and our carpet cleaning services very effective. If you think that it is time to do something special for your upholstery possessions, then please don’t hesitate to contact us and make a reservation. 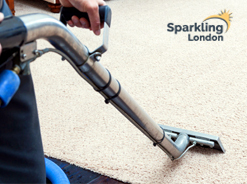 The carpet cleaning services we perform in London and the majority of the other areas of London are the best ones you can find.